C oral bleaching has been characterised over the past three decades in terms of climatic and physical drivers, but there is no universally agreed mechanism triggering the bleaching process, and it is possible that several independent mechanisms contribute to this response. Today's leading hypothesis into the cause of bleaching, is that it results from accumulated oxidative stress in the symbiont which accumulates in the host. C orals have mechanisms to supress the damaging effects of reactive oxygen species (ROS) using antioxidant enzymes and non-photochemical quenching (NPQ). Recent research has shown that the sulphur compound, dimethylsulphoniopropionate (DMSP) and its breakdown products, can act as an effective antioxidant to quench ROS. DMSP production by Symbiodinium is known to increase under elevated light and temperature, processes directly responsible for bleaching events, suggesting a possible role of DMSP in coral bleaching stress responses. T he project investigates the role of DMSP in coral health, specifically; it aims to understand the role of DMSP in coral physiology in response to bleaching. Using fluorometric, spectroscopic, biochemical and molecular tools in conjunction with advanced microscopy this thesis aims to answer: is DMSP produced or upregulated as a stress response in the symbiotic algae Symbiodinium? does DMSP have an antioxidant function within the symbiont cell and coral host, by acting as an reactive oxygen species (ROS) scavenger? and does DMSP help protect the coral host from bleaching? 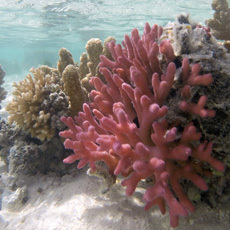 Stylophora pistillata on the Heron Island reef flat. 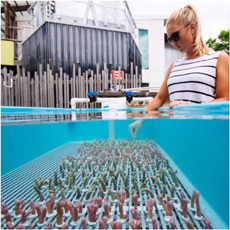 Steph Gardner checking her coral fragments for thermal stress experiments at Heron Island. Photo credit: Matthew Nitschke.